Talk about getting into the role. 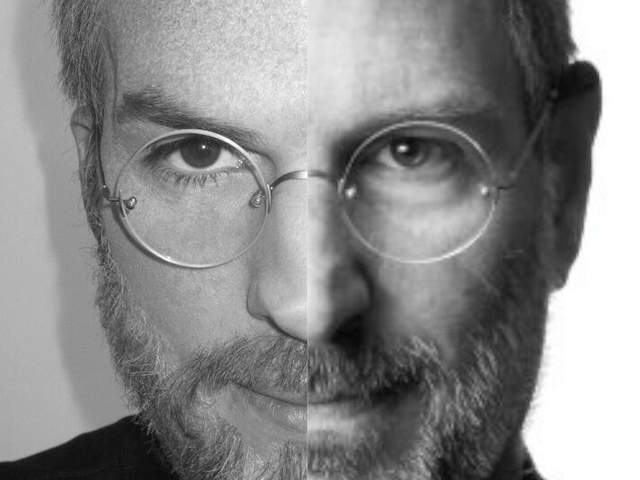 Ashton Kutcher posted a split-screen photo of himself and Apple co-founder Steve Jobs on Twitter, showing the actor's uncanny resemblance to the Apple co-founder he portrays in the new biopic "jOBS." Some may find it hard to tell who is who in the image. Steve Wozniak says scene "totally wrong" in Ashton Kutcher's "jOBS"
Underneath the photo, Kutcher tweeted: "Thank you Sundance for your support of Jobs [sic]." "jOBS" premiered earlier this month at the Sundance Film Festival in Park City, Utah. The verdict? So far, critics have not been huge fans of the film, although they have praised the 34-year-old "Two and a Half Men" star for his ability to capture the look and mannerisms of the former Apple CEO. Kutcher and his "jOBS" co-star Josh Gad (who plays Apple co-founder Steve Wozniak) made an appearance Thursday at the Macworld trade show in San Francisco, where Kutcher spoke to audiences about the lengths he took in preparation for the role, including adopting Jobs' fruitarian diet, which left the actor in the hospital with pancreatitis during the first few days of filming. "jOBS" opens in theaters April 19.